Here are some lovely treats to quickly make for those unexpected guests who pop in out of the blue. We would suggest that you keep on hand over the holidays at least 1 package of vegan puff pastry and a package of dried fruit. Handy to have are also a spare package of powdered sugar and a jar of apricot, raspberry or your favorite jam. Having these items, you will be able to whip up lovely treats in a matter of minutes. Place the prunes in a medium bowl. Pour 1/2 cup boiling water over them and allow them to soak and soften for few minutes. Meanwhile, soften the vegan cream cheese with whichever ingredient you choose. Just enough so that you can stead a bit down the middle of the puff pastry. Thaw the puff pastry sheets and preheat the oven to 350 F or whatever the package says. Lay the thawed puff pastry on a cookie sheet prepared with baking parchment. Put a tablespoon of the cream cheese diagonally from one tip to the other down the middle of each sheet. Take 3 prunes out of the water, shake and water dopes off and place one prune on each corner with the cream cheese and one in the middle. Carefully fold the empty corner over to the center and fold the opposite empty corner to meet it. Seal the two together with a bit of water. Place in the oven to bake for 15-18 minutes or until golden brown. 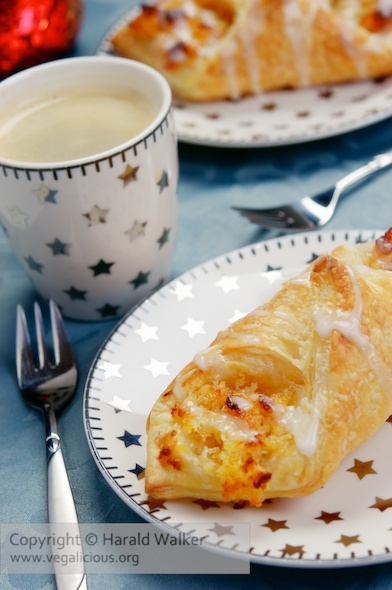 While the danishes are baking, you can make the optional frosting. Prepare an optional icing to drizzle on top. Mix the powdered sugar with a splash of lemon juice. When the Danishes are ready, remove from the oven and allow to cool. Using a knife or spoon drizzle the frosting over the cooled Danishes and serve. Preheat the oven to 350 F or whatever the directions are on the package of puff pastry. Thaw 4 sheets of puff pastry. While the pastry is thawing, chop the walnuts. In a small bowl, mix the apricot jam, coconut and chopped walnuts. Place the thawed puff pastry on a cookie sheet with baking parchment. 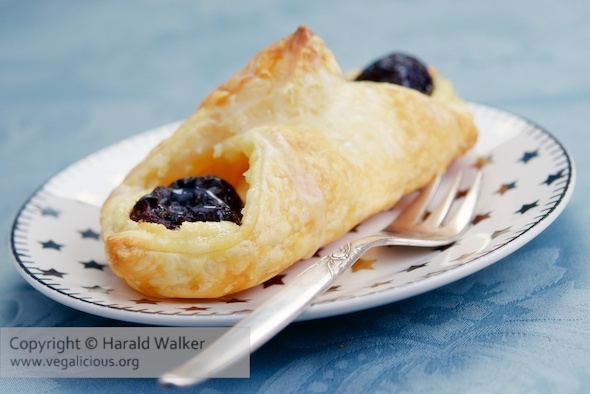 Put 1 tablespoon of the apricot mixture diagonally in the middle of each puff pastry sheet, from one point to the other. Fold one of the empty points over to the middle. Take the other empty point bring to meet, and place on top. Seal together with a bit of water. Do for each of the puff pastries. Place in the oven to bake for 20 minutes or until golden brown. When golden, remove from he oven and allow to cool. Using a knife or spoon drizzle the icing over the Danish. Posted by Chris Walker on December 23, 2010 in Apricot, Desserts and Sweets, Meals, Plum, Puff Pastry, Walnut.